Need to edit DVD movies in Windows Movie Maker but just find Windows Movie Maker doesn't even recognize the DVD files? Still trying to import DVD to Windows Movie Maker for editing? Here a great option to add DVD movies to WMM is provided. Just check it out. As we know, Windows Movie Maker supports a wide variety of video formats, including AVI, WMV, ASF, MPEG, etc. However, DVD is not supported. That means you need to first convert DVD to Windows Movie Maker supported video formats if you want to edit it in WMM. To do that, a DVD converter is needed. 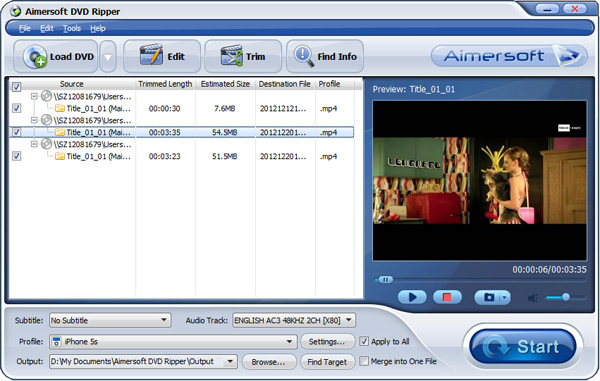 Here Aimersoft DVD Ripper for Windows is strongly recommended to extract video clips that are compatible with Windows Movie Maker from any DVDs. After the conversion, you can add the video files to Windows Movie Maker without hassle. First of all, download the program below and follow the steps to rip video from DVD from WMM. Insert the DVD disc into your computer's DVD drive, run the DVD converter and click Load DVD to import the DVD movies (DVD, ISO files or IFO files). 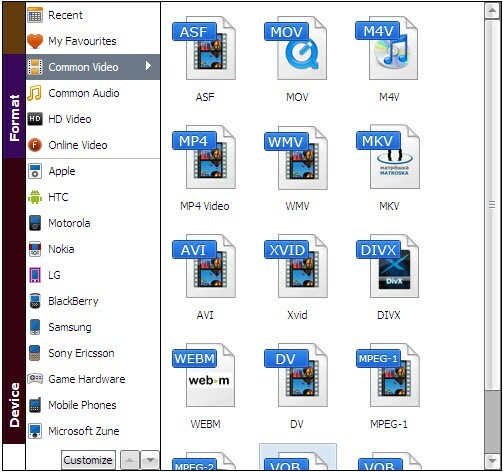 Or you can simply locate the DVD files and drag them to the program window to load them. After DVD has been loaded, you can select subtitles, choose audio tracks, preview DVD and take snapshots as you like. You can either convert all the DVD titles or just choose some titles to convert. And to combine all the added DVD titles into a single video files, just click the Merge into One File button to join all added DVD files. Some video editing functions are provided for you to get the exact part and effect you want. You can click Trim to cut the DVD movie to keep only the part you want or click Edit to crop, rotate, add watermarks, insert subtitles and more. Next, click Profile and choose WMV, AVI or ASF from Common Video as the output video format. For more advanced settings, you can click Settings to adjust the output video bit rate, frame rate, etc. And then just click the Start button to start converting DVD to Windows Movie Maker compatible video formats. After the conversion, click Find Target to locate the converted video files. After that, run Windows Movie Maker and click Import Video to add the converted videos. Congratulations! Now you can edit these files in Windows Movie Maker to create an eye-catching movie. There are five different versions of the Windows Movie Maker since its initial release in 2000. The first version was simply named as Movie Maker 1.0, which was packaged with Windows ME. The subsequent releases of Microsoft operating systems are offered with the program, with the Movie Maker 2012 being its latest version. Movie Maker 2012 comes with Windows 7 and 8.